In order to speed up web browsing, web browsers are designed to download web pages and store them locally on your computer’s hard drive in an area called “cache“. The cache contains a kind of travel record of the items you have seen, heard, or downloaded from the Web, including images, sounds, Web pages, even cookies. Typically these items are stored in the Temporary Internet Files folder. When you visit the same page for a second time, the browser speeds up display time by loading the page locally from cache instead of downloading everything again. This sometimes results in less than current versions of web pages being displayed. When the cache fills up, performance can slow down and your hard drive may run out of space. You should periodically clear the cache to allow your browser to function more efficiently. If you believe that you have a less than current version of a page, please see the following steps listed below to clear the cache in your browser. NOTE: You can also access this menu by holding Ctrl + Shift + Delete. Click Tools in the upper toolbar or click on the Tools icon. Click Internet Options and choose the General tab. Click Delete under “Browsing History”. Click Delete Files under “Temporary Internet Files”. Click Yes on the Delete Files dialog box. 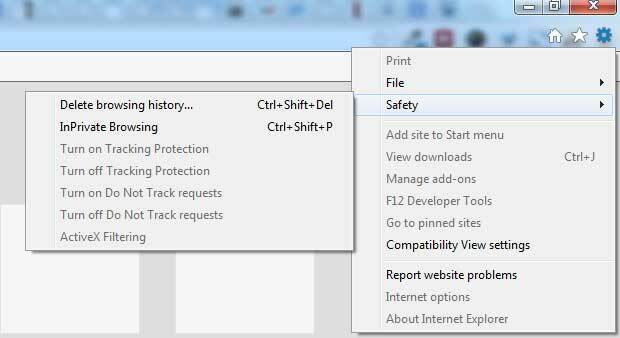 Click Close and then OK.
Click Internet Options to open Internet Properties. Click Tools in the upper toolbar. Check Delete all offline content. Click OK on the Delete Files dialog box. Click Tools in the upper toolbar and select Clear Recent History. Select the Time Range to clear (drop-down menu). – Select Everything to clear all cache. Click Details to choose what history elements to clear. Exit and re-launch the browser. Click Tools in the upper toolbar and select Clear Private Data. Click the Clear Private Date Now button. Click on Tools (gear icon) in the upper right toolbar and Select Reset Safari. Click Empty Cache and Remove All Cookies. Click Tools and select Delete Private Data. Click the Delete options and choose what history elements to clear. – e.g. Delete temporary cookies, Delete all cookies, Delete entire cache. Click Tools in the upper toolbar and select Options. Select Privacy under Options on the left side of the screen. Click Edit in the upper toolbar and select Preferences. Click the Triangle next to Advanced to expand it. Click on Safari in the upper toolbar and Select Reset Safari. Click on Safari in the upper toolbar and Select Empty Cache. Click Empty on the Are you sure message box. Click on Firefox in the upper toolbar and Select Preferences. Click Clear Now under the Private Data section. Click the arrow beside Web Browser.